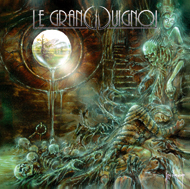 Founded in late 1996, LE GRAND GUIGNOL (back then acting under the name of VINDSVAL) release a first raw demo in 1997. Soon they discover their passion for outré compositions, preserving the harshness of extreme metal, yet adding wickedly catchy tunes, symptomizing in deep-felt emotions and thus creating gloomy atmospheres, which the band refers to as "grotesque metal". A first convicting piece of evidence is unearthed in 1999, embodied by the self-financed and -released debut-album "Imperium Grotesque". Years marked by live-performances and dedicated studio-work were to follow. Reconsidering both musical and lyrical concepts, coherence had VINDSVAL change their name into LE GRAND GUIGNOL at the dusk of 2006. In early 2007, MADDENING MEDIA prepares the stage for LE GRAND GUIGNOL, who hereby unleash upon the audience a masterpiece of yet unheard grandeur and grotesque sublimity, carrying the haunting name of "The Great Maddening". Just like its namesake (a french genre-theatre around the blade-crossing of the 19th and 20th century), Le Grand Guignol are ready to rise the curtain in order to let the public partake in their enrapturing tales of madness. Prepare for something different, something new, for a band which leaves the trodden paths in order to freely express their creative vision of heavy music. Eclecticism and excellence go hand in hand as they take the listener to a musical journey beyond belief. For about one hour, you plunge into a world where deep emotions depict the landscapes. No incidental melodies, no haphazardly chosen sounds, the effect of “The Great Maddening” is 100% intention as firm metal tones melt with an opulent classical orchestration and genre-external elements to generate a yet unheard musical complexity. Highest attention was put on the perfect elaboration of the sound-production (e.g. Mastering by Grammy-Award-winner Darcy Proper at Galaxy Studios – Manowar, Lacuna Coil, Porcupine Tree etc.). an eclectic metal stem bearing blossoms of classical orchestrations and put in a fin-de-siècle vase filled with blood, tears and wine.